dinissony 1 year, 9 months ago. THIS IS AN INITIAL BUILD WHICH MAY NOT BOOT AT ALL OR EVEN IF IT BOOTS IT MAY HAVE MANY BUGS. HAVE A BACKUP OF THE CURRENT ROM BEFORE FLASHING THIS ROM AND TRY AT YOUR OWN RISK. Installing a custom ROM on a Xperia Tablet Z (pollux, pollux_windy) requires the bootloader to be unlocked on the Xperia Tablet Z (pollux, pollux_windy) phone, which may VOID your warranty and may delete all your data. Before proceeding further you may consider backup all data on the phone. You are the only person doing changes to your phone and I cannot be held responsible for the mistakes done by you. Download and Copy the GApps and Lineage OS 14.1 for Xperia Tablet Z ROM ZIP to your phone. First flash the Xperia Tablet Z Lineage OS 14.1 ROM ZIP from device. Then flash the GApps zip from your device memory. Reboot and Enjoy the Nougat 7.1 Lineage OS 14.1 ROM for Xperia Tablet Z (pollux, pollux_windy). 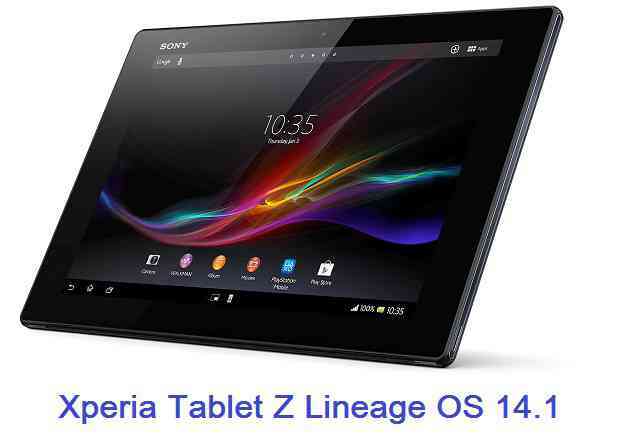 Copy the latest Lineage OS 14.1 for Xperia Tablet Z ROM ZIP file to your phone. Stay tuned or Subscribe to the Xperia Tablet Z (pollux, pollux_windy) forum For other Android Nougat ROMs, Lineage OS 14.1 ROMs, other ROMs and all other device specific topics. I’m having trouble with the install of lineage-14.1-20170502-UNOFFICIAL-pollux_windy.zip. The install itself seems to run fine, but when I start up, it doesn’t ask for a WiFi connection, and therefor cannot get past either the screen which prompts where I want to “Bring your data from…” or if I press set up as new, I’ll get “Setup Wizard has stopped”. This will repeat no matter how many times I let it restart and go through again. I’ve tried it multiple times with either open_gapps-arm-7.1-pico-20170503.zip, open_gapps-arm-7.1-nano-20170503.zip, or open_gapps-arm-7.1-mini-20170503.zip. I haven’t installed any previous versions of Lineage 14.1, and when I did try to install a previous version, it wouldn’t let me because I had installed this one (no matter which partitions I wiped System, cache, data, and Dalvik Cache). I don’t believe that even after wiping everything you are unable to flash a new ROM. The wiping might not have completed successfully. Or the TWRP might be problematic in this case. Can you clean the /system, then re-mount it and see if you have some content on it??? Basically this will prove that the /system partition is not wiped if you find some content in the partition. If that is the case then I will suggest you to try with some other recovery version !! the /system directory is clean, but the root directory isn’t, does the /system partition consist solely of the /system directory? should I also be wiping Internal Storage (and would that even do anything about this problem)? Update: I was able to go back to CM 12.1, then install lineage-14.1-20170316-UNOFFICIAL-pollux_windy.zip (which had a much higher download count). This version did prompt me for a WiFi connection, and worked fine. I would suggest developers look at the initial installation of the most recent patches, and ensure the WiFi connection works on startup after initial installation. Thanks @stevenas for the update. So updating the LineageOS 14.1 ROM on top of CM12.1 fixed the issue, is it? If yes then this will be a good information for those facing similar issue. Wiping and Updating to a previous major version (in my case I had 12.1) allowed me to then update to a previous version of 14.1 (after full wipe). Updating to the March 16 2017 version of 14.1 allowed me to get through the initial setup, and actually get it running, then I was able to update on top of that (with no wipes) to the current version. Good to know that you are running the latest Lineage OS. And yet again thanks for the detailed information. Excellent. Thank you. Any easy update from CM13. FYI it finished the lineage install with “E: unknown command. log” (or something like that) twice, before starting to install gapps; but it doesn’t seem to have caused any problems. Even the camera works properly now. 4-Led turn yellow and tablet boots. After read articles about the structure of original tft files from sony and the actual zip from Lineage i see a boot.img and not a kernel.sin or else, the all structure of files and mount are diferent.If you have a tip i apreciate. Best Regards.Thank you. Antonio Dinis from Portugal.